Censorship in this country is nothing new. Anyone who has worked in media is familiar with the way articles are ‘reviewed’ and ‘edited’ before going to publication. 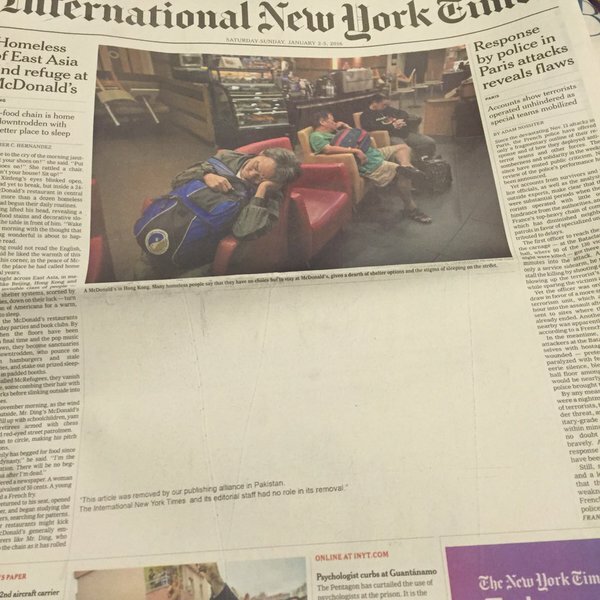 Even international media is censored before it is ever allowed to appear before a domestic audience. We are all too familiar with the famous cases of independent voices being silenced, either by banning them from writing, or in some cases, silencing them permanently. Less well known, but more common, though, is the practice of quietly deleting pieces that are deemed offensive by hypernationalist trolls and their patrons. The latest example is a blog post by esteemed lawyer and Jinnah historian Yasser Latif Hamdani which was quietly deleted within 24 hours of being published by Express Tribune. The post, which had raised a storm of hypernationalistic anger on social media, is available here with the author’s response to the censorship. The question we should be asking is not whether the author is right or wrong – that is for anyone to read and decide themselves. What we should be asking is why our hypernationalist brothers and sisters are so scared of allowing anyone to think for themselves. Why are they so scared of allowing anyone to be wrong? And what makes them so sure they are always right? Claims about protecting patriotic sentiments and defending national ideology are the oldest whines of civilisation. It is the countries with the most liberal speech laws that have the strongest ideologies, and it is those that constantly threaten and censor that always seem to be in danger. Wrapping censorship in new media doesn’t change that. I am writing this article as a rebuttal to Khuldune Shahid’s article “Jinnah’s Pakistan a mirror of his contradictions.” It is necessary because if you do not counter a falsehood in public domain over time it is taken to be the truth. It is sad that there are many OpEd writers who when writing on this topic do not check their facts or at least try and understand what the point of view is that they are challenging. Khuldune’s article is no exception. 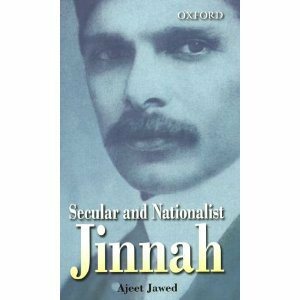 It draws on several strawman fallacies which have nothing to do the argument that Jinnah’s vision for Pakistan was a secular one. For days now we have heard the right noises but no action. We have heard religious leader after religious leader preach how Islam treats minorities equitably and justly. One wonders, then, why all the ulema of Sunni Tehreek and other sectarian groups are so unwilling to follow the glorious traditions of Islam and treat minorities generously? The rhetoric of the ulema sounds quite hollow given their actions. It was the bearded gentlemen of the Sunni Tehreek who had threatened the people who condemned Taseer’s murder with death. For them to turn around and condemn Shahbaz Bhatti’s murder is strange to say the least. Perhaps they realise that the world is not going to allow them to carry on with impunity. Therefore, every mullah and his mother-in-law are claiming the existence of a hidden foreign hand as being behind the atrocity. There is no foreign hand behind it. It is the three decades of General Ziaul Haq’s warped ideology that is behind it and it is the remnants of his illegal rule, the Jamaat-e-Islami and other self-styled thekeydars (guardians) of religion who are responsible. But Yasser includes an important reminder for liberals and minorities also – it’s not enough to be outraged. We must come together as a united group. However, there is a very important lesson for the minorities and liberal groups in the country. Silence is not an option and supporting the PPP as the lesser of the many evils is not going to work anymore. Even by conservative estimates Pakistan’s religious minorities number close to 10 million. That is more than the populations of Libya, Bahrain and the UAE combined. All religious and sectarian minorities need to come together on one platform with the Left and liberal groups in the country and form a grand coalition on a one-point agenda — holding the state to Mohammed Ali Jinnah’s August 11 pledge to the people of Pakistan and the world. The clearest duty on the part of every church and minority community organisation is to gather together their flock and take a cue from the civil rights movement to mobilise them in order to achieve real equality of citizenship and their stake in that ever-elusive Pakistaniat. Depending on the good behaviour of the majority is bad strategy, especially when we have a majority that is not only callous and cruel but is incapable of doing the right thing even in its own interest. The minorities and liberals must forge the power required to protect themselves constitutionally and legally. Only then can Pakistan be pulled back from the brink. It is well known that even under the Zia regime, religious parties could only get a small percentage of the votes in an election. This is a matter of basic maths – there are more moderate, tolerant people than extremist fundamentalists. There is no reason for us to live at the mercy of extremists. We only must choose to unite together to defeat this menace. All for one. One for all. Pakistani Zindabad. Two diametrically opposed articles on the status of women’s rights in this country appear in today’s news. They should both be read together, hopefully resulting in an open and honest discussion of one of the great . For all the Ghairat Brigade’s moaning and wailing about issues of foreign policy, where are they when our national honor is truly being assaulted? I am talking, of course, about the way that we treat women’s rights. Ayesha Ijaz Khan says that Asma Jahangir’s election is historic not only because she is a woman but because she is an independent woman who was elected on her own merit. There can be no accusations of sympathy votes or other influences, only a woman being elected based on her record of leadership. Notwithstanding the strategic support of other influential and conscientious members of the bar, Asma’s own hard work, courage and independent-mindedness over the years and through the darkest periods of Pakistan’s history cannot be overlooked. Whether one looks domestically or to the Philippines, India or Bangladesh, women have won elections on the back of sympathy votes after male members of their family have been martyred. Asma has done it all on her own. As such, Asma’s role as president SCBA may very well be greater than that of any other woman politician. Women have played an increasing yet limited role in Pakistan’s politics since Musharraf’s introduction of the reserved seats. Though not a bad way to boost female participation in politics, women who have availed of these seats are either beholden to familial politics or more obliged to toe the party lines for lack of their own constituencies. Asma’s independence, however, cannot be curtailed by either of these considerations, so the SCBA under her watch will surely be a potent force. And indeed Ayesha is correct. Asma’s election does make this point, and it certainly is a good omen for the future of women in politics. But most women are not politicians, they are not lawyers, and they do not have the resources or the support to be independent and self-confident like Asma Jahangir and Ayesha Ijaz Khan. So before we start praising ourselves too much for Asma’s fortune, let us keep in the front our minds that the fate of too many women in this country is described more accurately by Yasser Latif Hamdani’s column in Daily Times today. To start with, in many parts of this country women are treated worse than cattle. Not only are women discriminated against by custom and tradition but also by the inheritance law and the law of evidence. Imagine our embarrassment as lawyers when we advise foreign clients to use male witnesses on contracts because thanks to General Zia our law does not think women are credible in financial matters. For a society obsessed with shame and honour we also believe in honour killing. One of our judges, who rose to be the president of this country thanks to one of the major political parties, had ruled that women had no say in deciding who to marry. Relying on misinterpretation of the Holy Quran by lazy clerics, the men in Pakistan have a free hand in abusing their wives, both sexually and physically. Women, who despite all these handicaps make it in professional and public lives, become fair game, often by other women. Consider the case of Dr Firdous Ashiq Awan abusing Kashmala Tariq shamelessly on TV, while the TV anchor egged her on. One is reminded of the events after the rigged elections of 1965 when Gohar Ayub Khan carried out a procession allegedly with a female dog to signify none other than Ms Fatima Jinnah, who is widely considered a founding mother of Pakistan. While it said nothing about Fatima Jinnah, it indicates what the Pakistani male thinks and feels about women. A woman to the geniuses of Pakistan can be either mother or a loose woman and at the end of the day even the mother becomes a loose woman. This mentality reached its zenith when a proud president in uniform declared that women in Pakistan get raped to get Canadian citizenship. This is not news. I’ve pointed out the hypocrisy of the self-appointed Ghairat Brigade when they took to the streets to protest the treatment of Dr Aafia, but refuse to lend any help to the plight of our daughters here at home. We have known about this double-mindset on women’s rights for some time. The election of Asma to president of SCBA is indeed historic, and her level-headed thinking will hopefully inject some reason into what have become unnecessarily contentious debates. But let us also use this occasion to recall that no all women in this country have the same rights and privileges as Asma Jahangir. But that will never change until we decide to make it change. Yasser Latif Hamdani says that just as America’s NPR fired a reporter for making derogatory comments about Muslims, so our own media should show the same respect for our own daughters and refuse to continue paying a handsome salary to Syed Talat Hussain after his vicious anti-woman rant in Daily Express. It will be informative to see if DawnNews, Talat Hussain’s new employer, will show more respect to this type of bigoted, anti-woman talk or if they will show more respect to women. Sadly, I think I can predict the outcome. 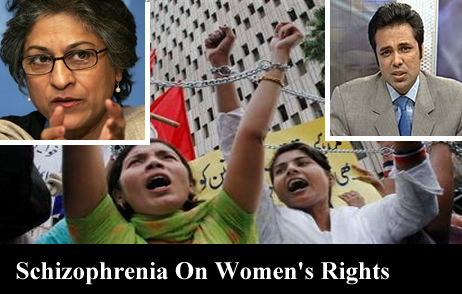 We must break this cycle of hypocrisy and schizophrenia on women’s rights. Sexist bigots will continue to spout their nonsense in the media, and vicious bullies will continue to beat their wives and daughters (and much worse) until we as a society take a stand and say THIS STOPS NOW.